Reiki is a form of Japanese healing developed as a spiritual practice in the early 19th century. The techniques of Reiki are simple and easy to learn as it is passed from the Reiki master to the student through attunement, giving the student life force energy that will allow for quality of life enhancements and personal healing. Reiki is administered by the laying on of hands(on or above the body) to reduce stress, promote healing, and enhance relaxation. Reiki, which translates roughly to Spiritual life force, is a safe and natural method used to treat the mind and body, the emotions, and the spirit. Reiki effectively enhances feelings of peace and safety and personal wellbeing. Anyone can use Reiki for self-improvement and spiritual healing including those who suffer any sort of health or mental issues, as it works as a complementary therapy that will not interfere with traditional therapies, and may actually enhance their effectiveness. Though Reiki is considered a form of spiritual healing, it does not have religious roots and requires no belief systems. Reiki will work whether you believe in its ability or not. What’s more, Reiki is thought to actually come from God, and its practice often results in the student feeling more in tune with the core of their religious beliefs. Reiki was developed by the Japanese Buddhist Dr. Mikao Usui and continues to be used to promote physical, emotional, and spiritual healing and universal peace and harmony. 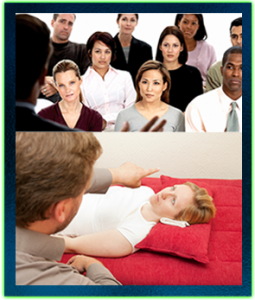 The combination Hypnosis & NLP Certification Seminar is offered twice per year to prepare students for a rewarding and lucrative career. This training is facilitated by Eli Bliliuos, a Master Hypnosis Trainer who has been certified by the IACHT, the NGH, and the IACT. Upon successful completion of the course, students will be certified by the International Alliance of Certified Hypnotists & Therapists.